As part of renewed secuirty measures adopted in borno state, journalists based in the state are banned from entering and covering the scheduled extra ordinary emergency secuirty meeting of all secuirty stakeholders in Borno state Monday evening which started late 7 pm against the earlier scheduled 4 pm. 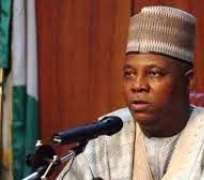 The meeting which was held at a closed door at the Government House Multi Purpose Hall Maiduguri for secuirty reason was convened at the instant of Governor Kashim Shettima as the Chairman Northern States Governor Forum and. Chiief State Secuirty Officer as well as the Chairman of the Emergency Secuirty Meeting. All the 13 National Assembly members from Borno state were expected to attend the meeting along with their 28 Borno State House of Assembly counter part, all the state commissioners and 27 LGC a Caretaker Committee Chairairnen, particularly, those from the affected LGAs of the state. Others include the Theater Commander, Operation Lafiya Dole , GOC 7 Division, Nigerian Army, State Director SSS, Commissioner of Police, State Cimmandant, NSCDC, State Comptroller of Nigerian Customs, Nigeruan Immigration Service and Nigerian Prison Service and NDLEA as well as Leaders/Heads of CJTF and Vigilante Hunters. The meeting also has the religious, community , political and traditional leaders such as the Shehu of Borno, HRH, Alhahi Abubakar Garbai Ibn Umar El Kanemi, Emirs of Dikwa, Bama, Gwoza and Askira/ Uba among others. Others in attendance were the Chief Imam of Borno, District and Village Heads, CAN, JNIN, Nigerian Legion,, Chairmen NLC, NBA, CLO,s, ASUU, NASU, VC University of Maiduguri, NCWS, Rector Ramat Poytechnic,NURTW Provost College of Education, NARTO, CMD State Specialist Hospital, CMD UMTH, Keke NAPEP, Cattle Readers Association, RTEAN, Monday Market and Fishers Association Baga Road among others . The participants at the meeting were expected to deliberate extensively on the secuirty challenges bedevilling the state persistently and come out with resolutions and recommendations that would be adopted and endorsed for onward submissio to President Buhari through a delegation that will be consitutted at the end of the meeting.